GLENVIEW – Regular patrons of Glenview Road’s thriving downtown commercial district have yet another compelling reason to shop local: Forza Meats. The Italian market/butcher-shop, located near Core Power Yoga and The Glenview Grind, is the latest commercial enterprise to set up shop on the street level of Glenview Road’s luxury apartment building, Midtown Square. With its sleek, industrial-style build out, subway-tiled walls and dramatic ceiling heights, Forza Meats represents a new generation of butcher shops, a place where customers might grab a grilled panini or submarine sandwich during their lunch hour, or sit at a counter to linger over a cold drink and a fresh Ceasar salad. Forza’s 20-foot butcher counter, stocked with traditional cuts of pork, beef, lamb and chicken, shares the limelight with a refrigerator full of ready-made meals-to-go, including Meat Lasagna, Porchetta-style Pork Loin, bake-at-home pizzas and a selection of house-made “MaMa Minelli” pasta sauces. Forza Meats is the brainchild of third-generation butcher Mario Minelli and his business-partner, Tyler Pontarelli. 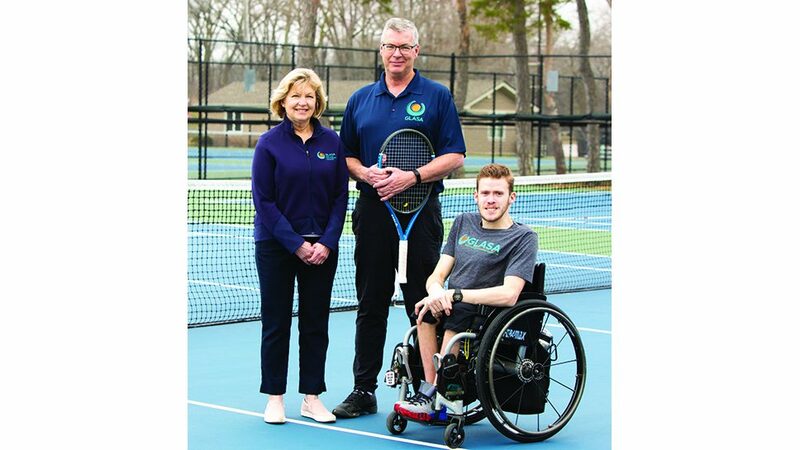 Born and bred in Glenview, the co-owners have been friends since they played T-ball together some 30 years ago. Minelli’s grandparents, who emigrated from Italy in the 1920s, owned a butcher shop in downtown Chicago before opening Minelli Brothers on Milwaukee Avenue in Niles in 1970, where Mario continues to work with members of his extended family. 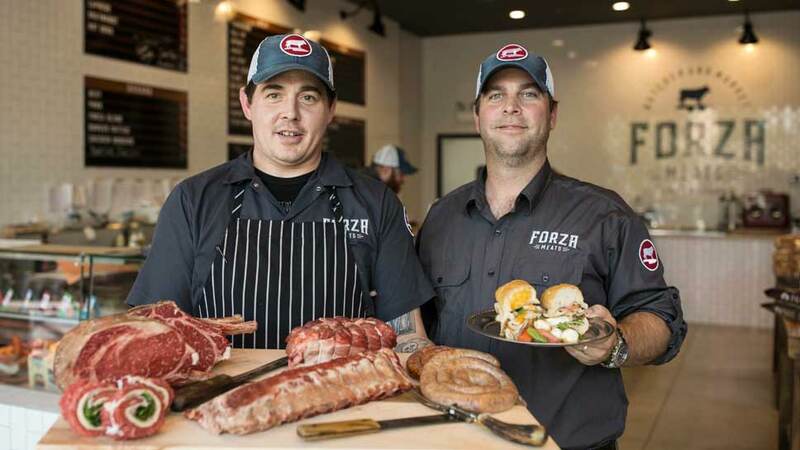 Minelli and Pontarelli brought in Jimmy “The Butcher” Shay – a well-known figure in the Chicago food scene – to run Forza’s meat counter, officially opening their doors on June 27, just in time for the summer grill rush. Dressed in crisp grey shirts, pinstripe aprons, and branded baseball caps, knowledgeable employees serve up Forza’s broad menu of sandwiches priced between $7 and $13 for a whole, including The Menza Menz, a thick stack of corned beef pastrami and provolone topped with lettuce, tomato, pickles and caraway mustard. Vegetarians may like The Giardino, a cold sandwich made with muffaletta – a spicy Italian olive salad – and layered with roasted red peppers, artichokes, and arugula, topped with fresh mozzarella. On the hot side, Forza offers the Four Meatball Sub, featuring the late Grandma Minelli’s famous meatball recipe. “My grandmother literally rolled meatballs until she was 99 years old,” said Minelli. Salads with clever, self-explanatory names range in price from $11 to $12, including The Butcher’s Chopped, We Got The Beet, and Forza’s house Caesar, The Brutus. Forza’s meat is all sourced from Slagel Family Farm in Fairbury, Illinois, fifth-generation farmers who pride themselves on farm-raised, hormone free products. 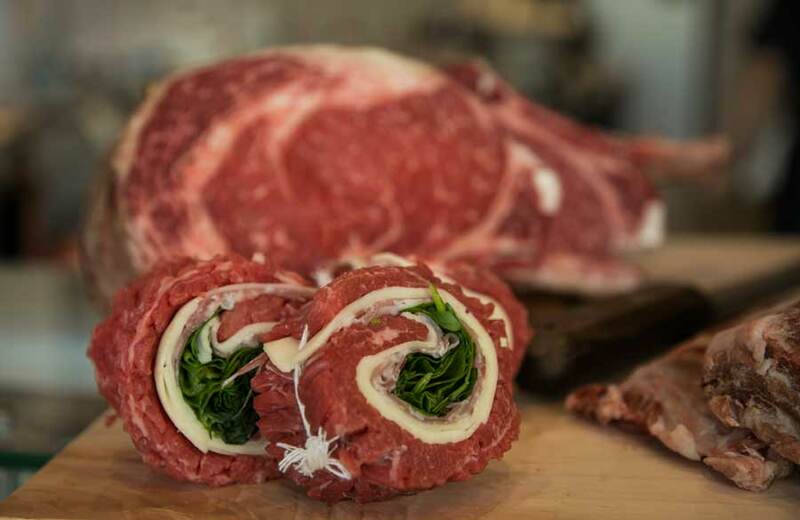 Forza’s butcher-shop offerings include its house-made sausages in flavors like Italian, Caprese, Hungarian and Chorizo Fresco as well as traditional cuts of beef like tenderloin ($29/lb. ), brisket ($7/lb.) and rib eye ($22/lb.). Ready-made kabobs sell for $8/lb. On opening day, Forza was featuring its Speciale Del Giorno: a 35-day dry-aged rib eye priced at $29/lb. Judging from Forza’s soft opening, when it quietly opened its doors a week early to test the market, the future looks bright. 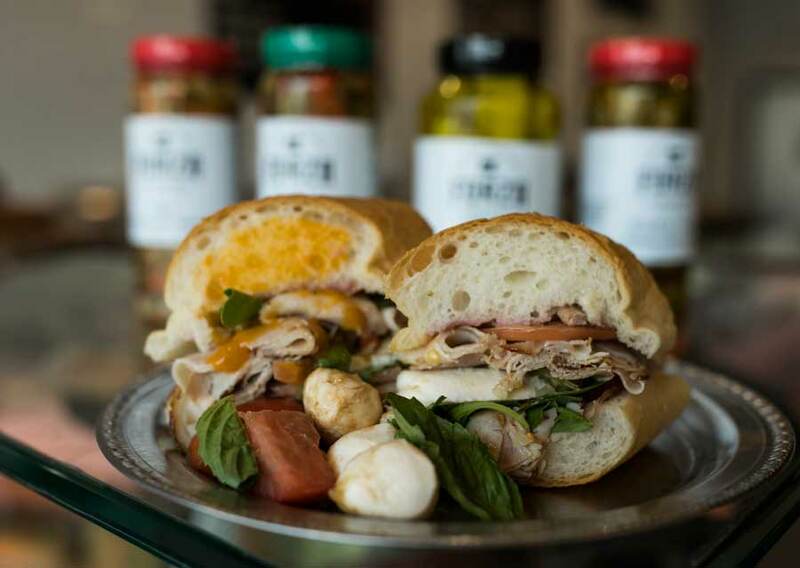 Minelli said customers flooded in, eager to support Glenview Road’s latest newcomer.